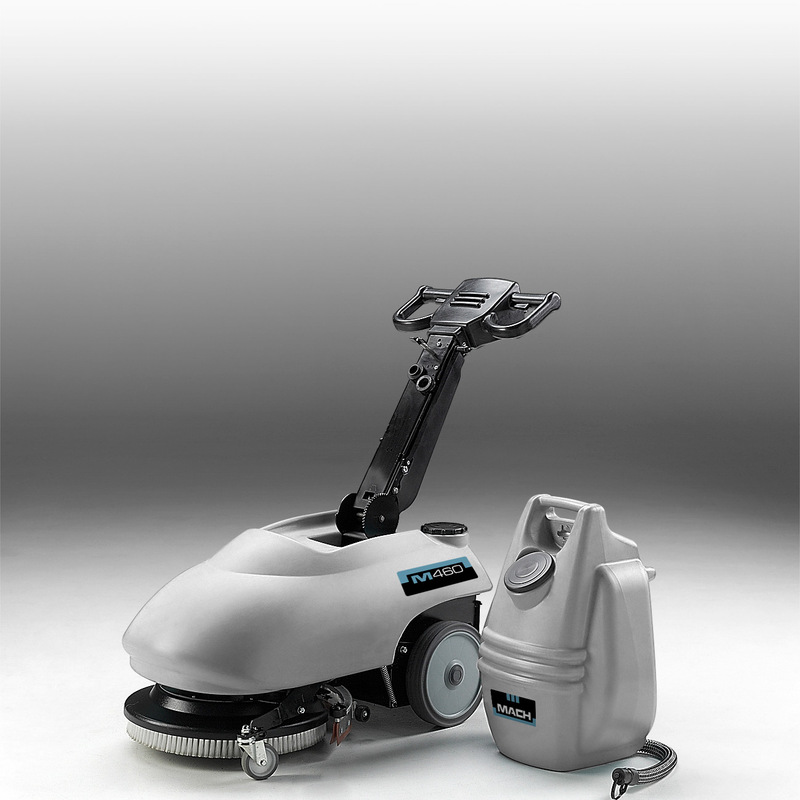 The only 460 mm walk-behind auto-scrubber, which can completely clean and dry corners. Large capacity removable tanks provide the perfect volume of water required to achieve a high performance clean, while the innovative water recovery system delivers clean, dry floors in a single pass. M460 - high capacity tanks for continuous cleaning of hard to reach areas. 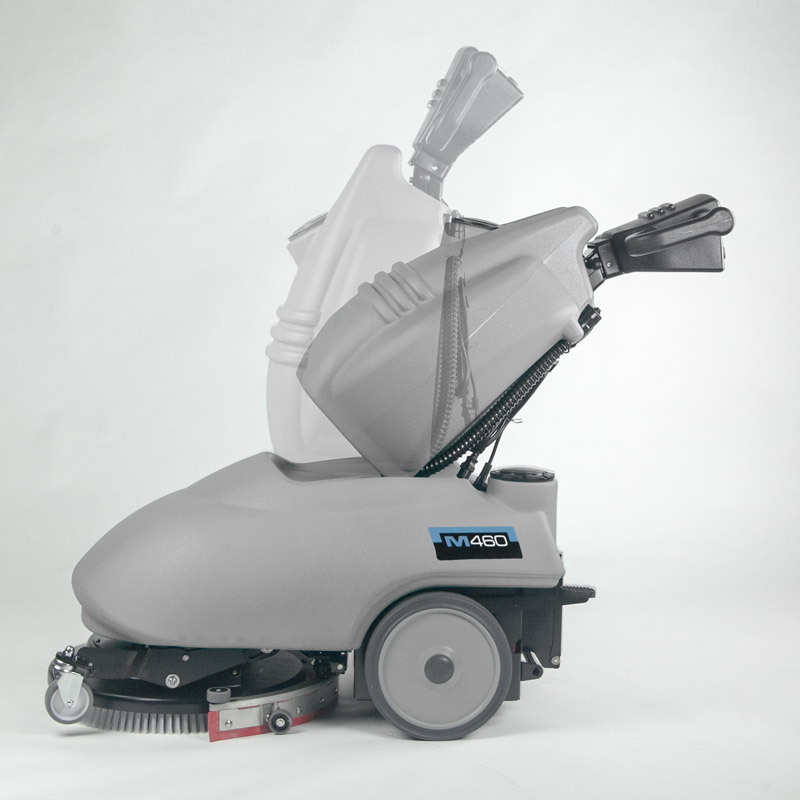 The M460 is the only 460 mm / 18 in walk behind auto-scrubber, which can completely clean and dry corners that are inaccessible with a traditional scrubber-dryer. 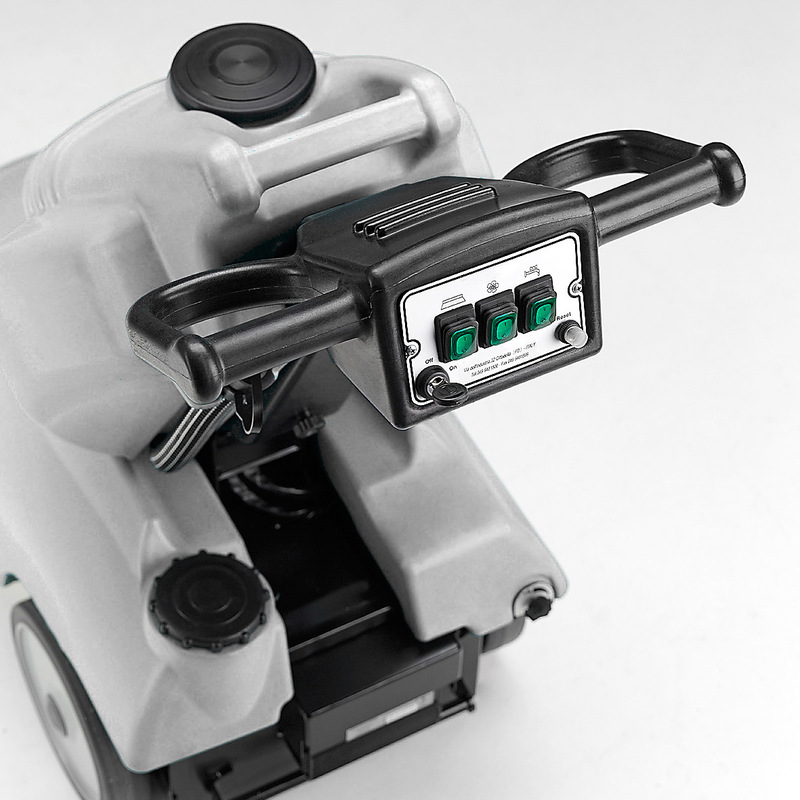 Its unique size and high maneuverability allow access to hard to reach areas and perfect cleaning around objects. 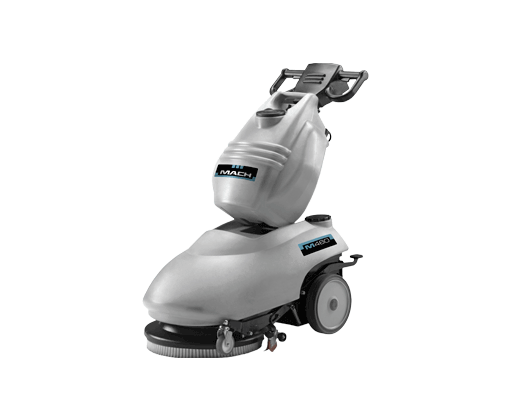 The 460 mm / 18 in cleaning path and a top speed of 3.5 km/h / 2.2 mph enables a productivity rate of 1.600 m² / 17,200 ft² per hour. It’s impossible to clean a floor perfectly without sufficient water. The M460 has an impressive 28-litre / 7.4 gal solution tank and 30-litre / 8 gal recovery tank, which deliver the optimum volume of water to the brush pad for the best results. These large capacity removable tanks are unique, delivering continuous cleaning power for even longer. Clean, safe floors without needing to stop and refill. It is available in two versions, with a 12 V battery for completely flexible cleaning or with a power cord for unlimited running time. 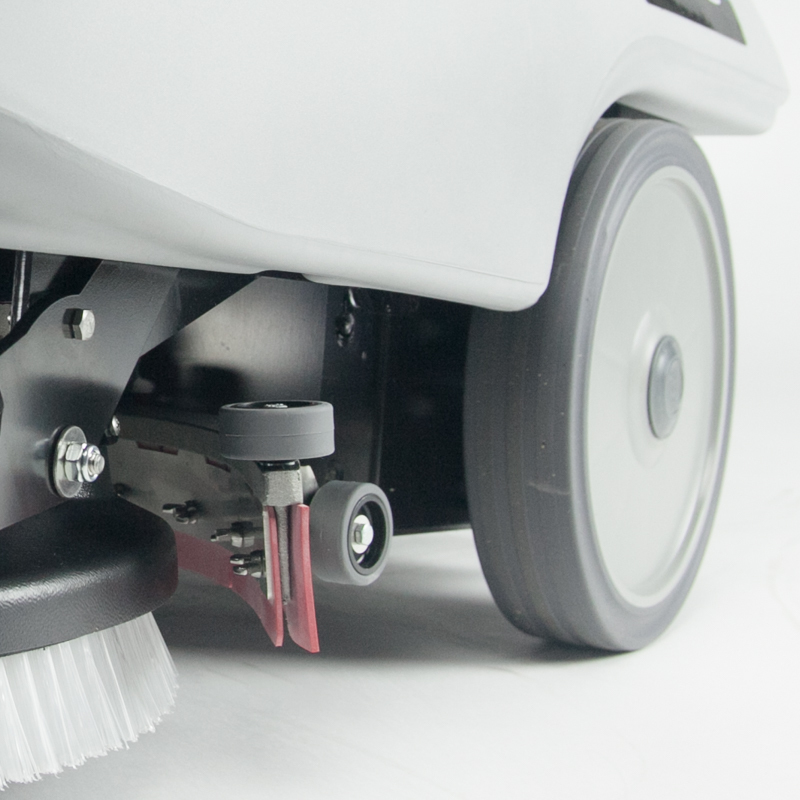 The compact design and 460 mm / 18 in cleaning path are perfectly adapted to clean narrow and confined spaces, high maneuverability allows easy access to corners and responsive operation. 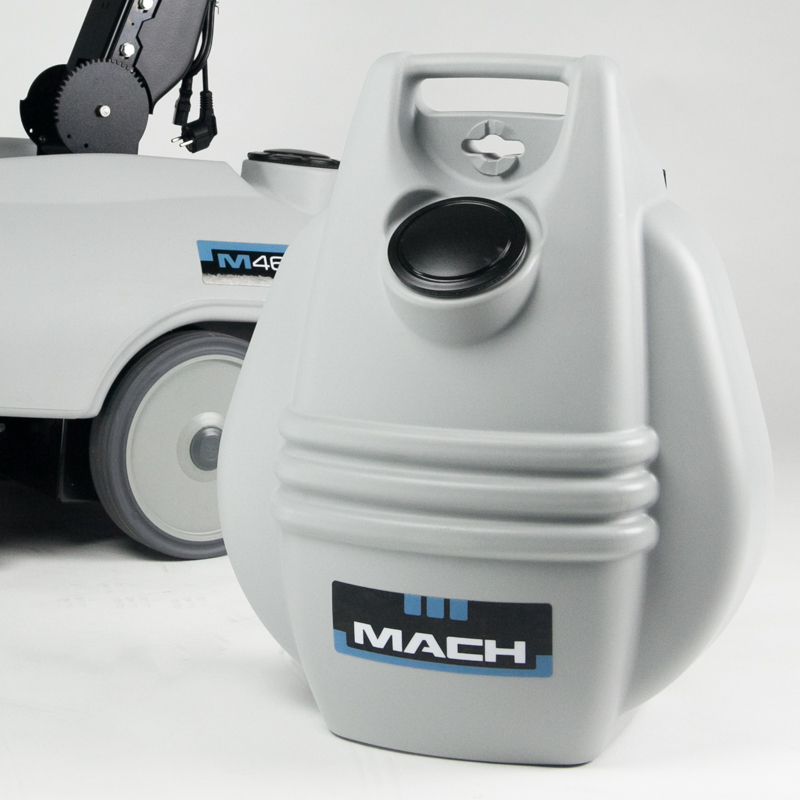 The innovative water recovery system guarantees optimum water pickup and maximum dirt removal, ensuring a perfectly clean floor whilst avoiding the risk of slip and fall accidents. It is impossible to clean a floor effectively without sufficient water. The M460 has a large 28-litre / 7.4 gal solution tank to deliver the perfect volume of solution required to achieve the best results, without having to stop and refill. 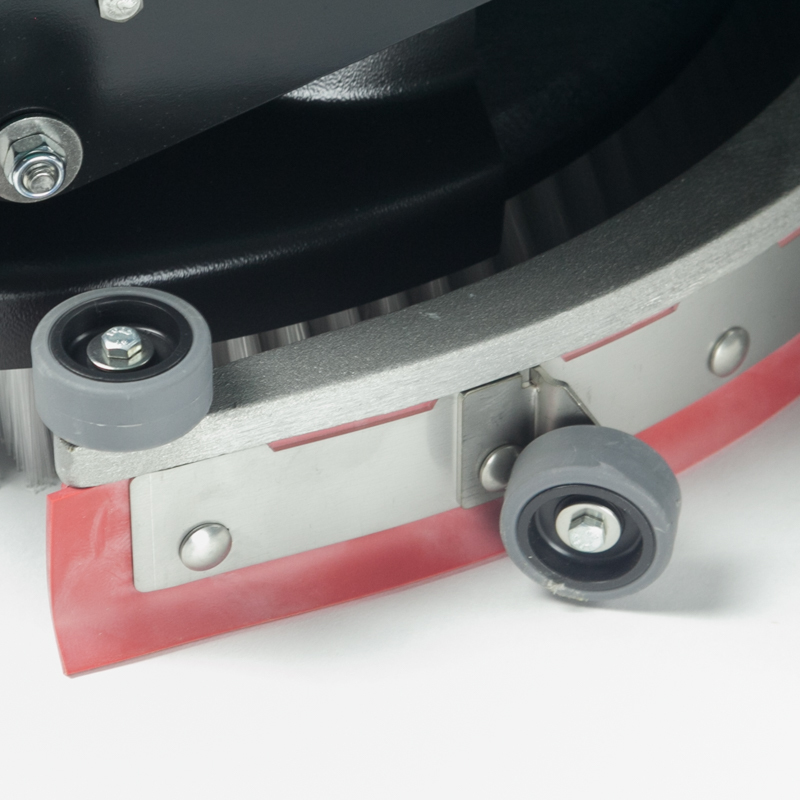 The adjustable parabolic squeegee distributes down pressure evenly along the length of the blades, delivering consistent cleaning results no matter what the surface. Tool free replacement makes maintenance easy. 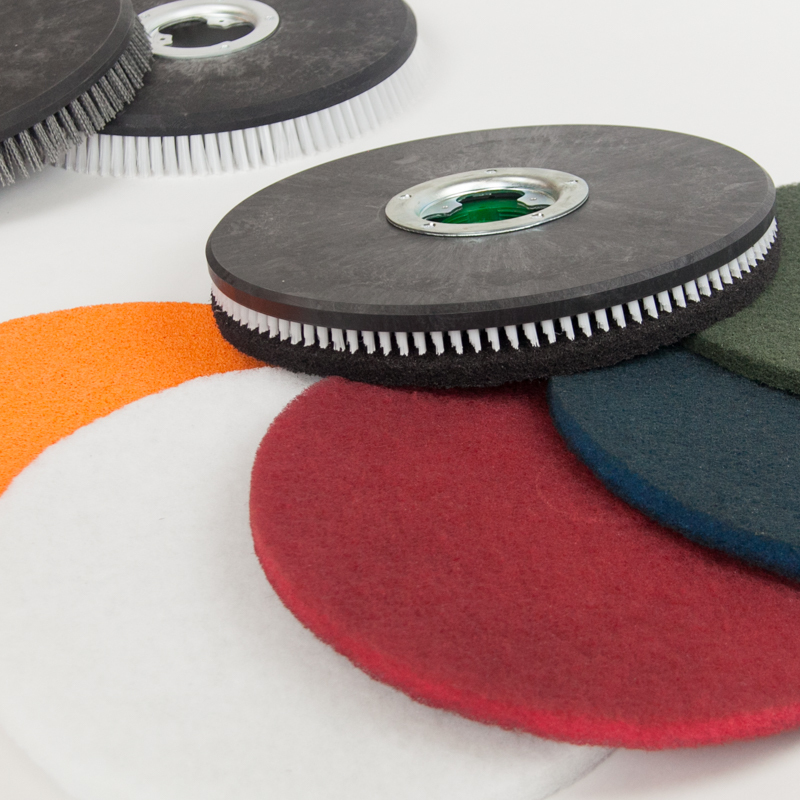 Choose from a range of brushes and abrasive pads according to your floor type, all fitted without tools. Tailored to the operator, the only 460 mm / 18 in scrubber with a removable 30-litre / 8 gal recovery tank, simple to use with a built in handle and easy hose for hygienic and fast emptying. 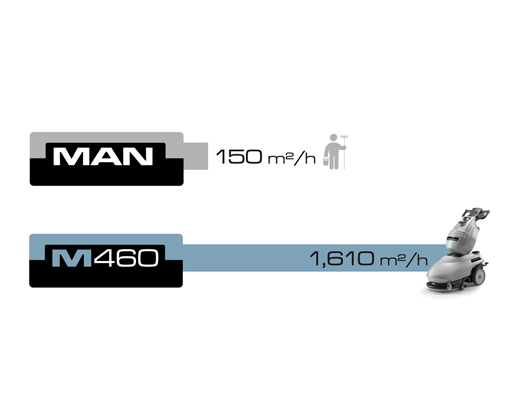 The M460 has an ergonomic handle that can be adjusted to the operator for optimum comfort during use. 2 x 12 V maintenance free batteries delivers 2 hour and 40 minutes of operation on a single charge for flexible and safe cleaning without a cord. 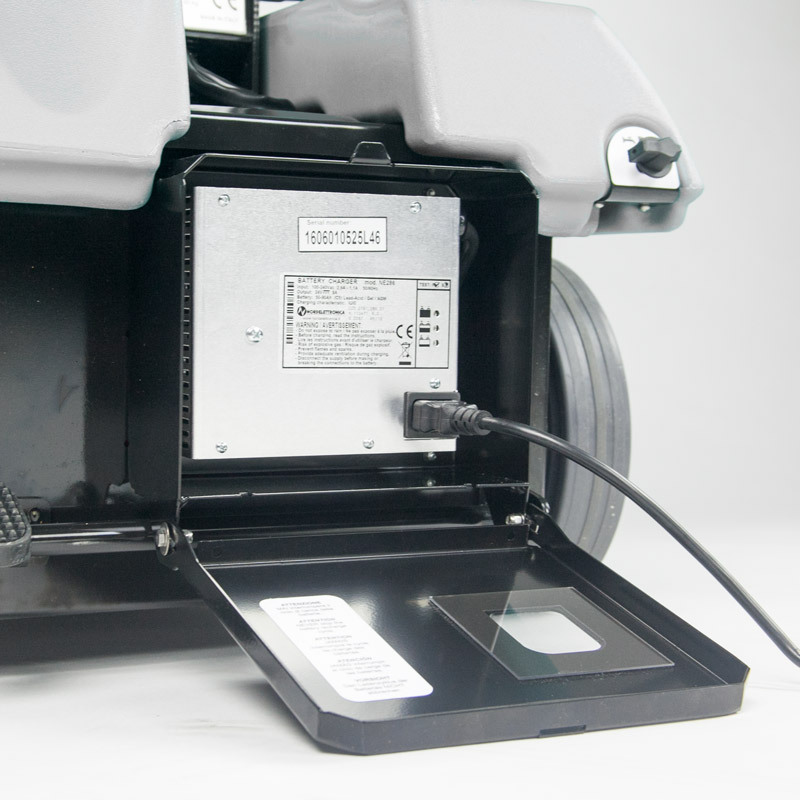 The on-board charger is fully protected in steel casing with easy access.